Lauren Thompson. 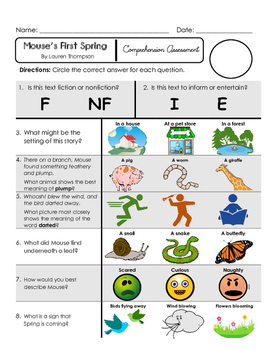 What makes this assessment different from the many others out there is that, although it is written for the primary grades, it is comprised of questions that mostly require higher-order thinking. High level questioning has become one of the most important cornerstones of educational assessments today. Two copies of this assessment are available: one in full color and the other in grayscale. 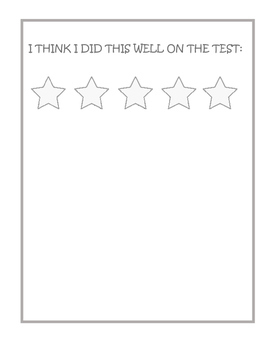 An optional back page, with five blank stars, is provided as well, for students to self-reflect on their testing success. 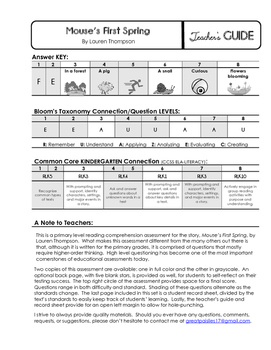 The top right circle of the assessment provides space for a final score. Questions range in both difficulty and standard. Shading of these questions alternate as the standards change. 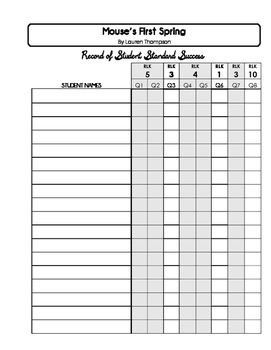 The last page included in this set is a student record sheet, divided by the text’s standards to easily keep track of students’ learning. Lastly, the teacher’s guide and record sheet provide for an open left margin to allow for hole-punching. I strive to always provide quality materials. Should you ever have any questions, comments, requests, or suggestions, please don’t hesitate to contact me at greatpaislies17@gmail.com.